Elizabeth D. Moore, Consolidated Edison, Inc. In this historic time, when the corporate landscape may be changed forever, MCCA’s survey of the 2008 Fortune 500 and Fortune 1000 companies2 reveals that top legal women officers showed remarkable resilience, with only a small decrease in their number. Unfortunately, women general counsel were at the legal helm of companies that suffered some of the biggest financial losses in 2008, including American International Group (AIG), Fannie Mae, Conoco Phillips, Merrill Lynch, Realogy, Office Depot, and Allstate. Overall, however, there was only an 8% decrease in the number of women who head Fortune 500 legal departments from MCCA’s last survey. In a year of financial disaster that spared neither corporations nor individuals, companies were paradoxically afflicted with high revenues and low profits. The big picture for the Fortune 500 showed a modest increase in revenues to $10.7 trillion (a 0.8% increase from 2007), but profits were only $98.9 billion—a decrease of almost 85% from the previous Fortune 500 survey.3 The events of the past year reversed the extraordinary and unprecedented profit trend that carried through into 2006. The combined profit figure for companies led by women general counsel showed a decline from a profit of $10.69 billion in 2008 to a loss of almost $52 billion this year. One of the most significant players in this disaster was AIG, which posted losses of $99.3 billion, making it the biggest all-time money loser in the history of the Fortune 500. On the other hand, the two companies with the fastest growth in profits last year have women at the legal helm—Terri Plummer at fastest-growing United Parcel Service, and Rachel Seifert at runner-up Community Health Systems. This year’s small decrease in the total number of women in the position of general counsel at the nation’s 1,000 largest companies reverses the increase reported last year. But in a year of the most significant downturn for America’s big corporations since the Great Depression, the position of women general counsel has remained basically constant in the Fortune 1000 landscape. This year, 85 women served as top legal officers in Fortune 500 companies, a decrease of 5 from the 2007 survey and a decrease of 7 from 2008. Five women are new to the Fortune 500 general counsel list, with three replacing male counterparts and one replacing another woman (Elizabeth B. Chandler replaced Lynne A. Burgess at Asbury Automotive Group). Information on Kathryn McNamara Corley’s predecessor in the role of general counsel at Discover Financial Services was not available as this issue went to press. Andrea L. Zopp, a former GC of Sears, was recently appointed to head up the legal department of Exelon Corporation, taking over for William A. Von Hoene Jr., himself newly promoted to other corporate responsibilities in the company. 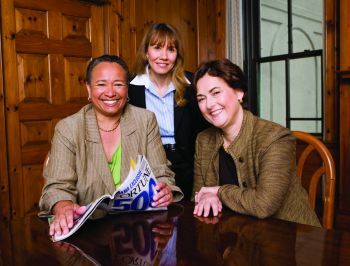 The 2009 roster of top women legal officers of Fortune 500 companies consists of 75 white/Caucasians (non-Hispanic), 6 African Americans, 2 Hispanics, and 1 Asian Pacific American. (As we went to press, the ethnicity of one woman general counsel could not be confirmed.) Last year’s list included 83 white/Caucasian, 4 African American, 2 Asian Pacific American, and 3 Hispanic women general counsel. Despite unprecedented industry turbulence, companies representing real estate, commercial banking, and financial services remained on the 2008 list. Women general counsel continue to lead legal departments of a diverse group of industries, which also included petroleum/refining, health care, computers, airlines, utilities, Internet services, and food & grocery. Publishing continued to maintain one spot on the Fortune 500, as did the tobacco industry. The 85 industry leaders appearing in our survey are found throughout the continental United States, but almost half are based in only four states. New York hosts 11 companies with women general counsel; California and Illinois each have 9 corporations on our list; and Texas is home to 8 top-ranking companies. In the face of a $98.9 billion decrease in profits for the Fortune 500 as a whole, how did this economic meltdown impact companies led by women general counsel? As a group, the 85 companies on the Fortune 500 with women general counsel reported total revenues greater than $1.6 trillion. In the previous report, total revenues for 92 companies in the same category exceeded $1.85 trillion. As noted earlier, companies on our list last year posted significant profit; this year, however, in keeping with the realities of American businesses throughout the Fortune 500, the companies on our list combined to post a net loss. In addition to AIG (although none of the other companies’ losses compared to the global insurer’s loss figure), 21 other companies in this year’s group of 85 posted losses: Conoco Phillips, Valero Energy, New York Life Insurance, Allstate, Prudential Financial, International Paper, Nationwide, Continental, Office Depot, R.R. Donnelly & Sons, Liberty Global, Eastman Kodak, Hexion Specialty Chemicals, Thrivent Financial for Lutherans, Avis Budget Group, SunGuard Data Systems, Unisys, Asbury Automotive Group, Realogy, and Brunswick. As in last year’s survey, the vast majority of companies with women general counsel posted revenues between $5 billion and $25 billion (67 companies). And companies with revenues greater than $25 billion on this year’s list (13) greatly outnumbered companies with revenues of less than $5 billion (5). In this year’s survey, 41 women—5 fewer than in 2008—led the legal departments of highest-grossing Fortune 250 companies. Several women general counsel who left Fortune 500 companies were replaced by men (Fannie Mae, Humana, L-3 Communications, Family Dollar Stores, Nordstrom, Wesco International, C.H. Robinson, and Liz Claiborne). At Sara Lee, an African American male succeeded Peggy Foran, who recently left the company citing personal reasons, as general counsel. Two companies fell out of the top 500 list in 2009, but remained within the top 1,000: KB Home Builders, with Wendy Shiba as its general counsel; and Pacific Life, with Sharon Cheever in the same role. Merrill Lynch was acquired by Bank of America, removing Rosemary Berkery from Merrill’s GC role and the 2009 list. Three companies—Countrywide Financial, Electric Data Systems, and Trane—fell off the list completely. 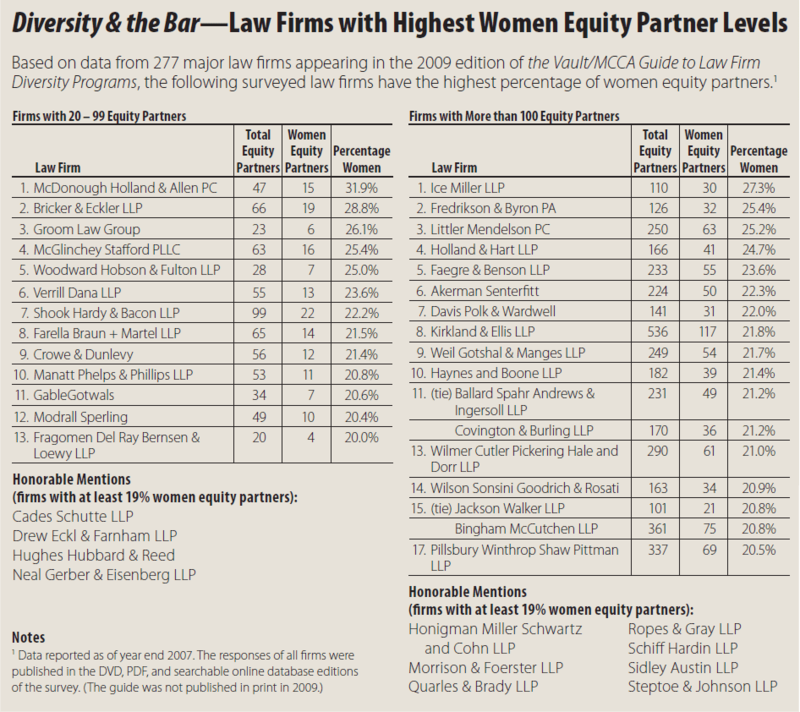 In the 2009 survey, only two fewer women general counsel appear in the Fortune 1000—76 this year, down from 78 in 2008. Despite this decrease, this group represents a net gain of four companies compared with the 72 reported in 2007. Nine new names appear on the 2009 list: Maria Pasquale of Celgene; Kimberly Frye of Key Energy Services; Laura Ozenberger of Inergy Holdings; Tory Tidwell of Cypress Semiconductor; Rebecca Polak of KAR Holdings; Valerie Gentile Sachs of OM Group; Carolyn Wolski of Michael Foods; Denise Colerly of BMS Software; and Sandra Marino of Pall. Most of these women made the list because their companies newly ascended the ranks to join the Fortune 1000 this year. The two exceptions to this are Kimberly Frye, who replaced a male general counsel at Key Energy Services; and Sandra Marino, who replaced Mary Ann Bartlett at Pall. New companies to the list represent such industries as wholesaling, computer software, semiconductors, and chemicals. As referenced earlier, one company dropped down from the top 500: homebuilder KB Homes fell from 340 on the 2008 list to 682 this year. The list of Fortune 1000 companies led by women general counsel runs the industry gamut, from gas and electric utility companies and food and food services companies to specialty retailers, health care, insurance, building materials, securities, publishing, and others. Fortune 1000 women general counsel can be found in offices from coast to coast in the United Sates, as well as in Puerto Rico. California hosts the most corporate headquarters with ten, followed by Ohio with eight, Texas with seven, and New York with six. This year’s survey revealed that 19 women have dropped off the Fortune 1000 list since last year’s ranking. Three of those led companies that rose to the Fortune 500: Nash-Finch, Con-way, and CH2M Hill. Ten other women are not listed simply because their companies did not make the top 1,000 this year: Solutia, Energizer Holdings, Superior Essex, Utstarcom, CSK Auto, Perkin Elmer, Agilysis, AIMCO, Dollar Thrifty, and Potlatch. Four departing women general counsel were replaced by men. One woman replaced another woman at Pall, as noted earlier. And at Children’s Place Retail Stores, the general counsel position has been eliminated in favor of using outside counsel. MCCA’s 2009 survey of women general counsel draws on financial data in the American corporate landscape that, hopefully, will be viewed as an anomaly by 2010. Yet, despite the extraordinary decline in profits that the survey reported, the picture for women general counsel remains essentially stable. Revenues did not take a nosedive, but instead remained close to the 2008 figure. And this elite group of top corporate women lawyers saw no mass exodus as its members steered their corporations through financial challenges never experienced before. No one seeks a trial by fire, but lessons learned during such a time can only create superior knowledge. These lessons are being learned not only by general counsel of major U.S. corporations, but by the entire world. 1 Allan Sloan, Market Myths, Fortune, May 4, 2009, 38. 3 Shawn Tully, Pop! Went the Profit Bubble, Fortune, May 4, 2009, 137.